Boston Fruit Slices are sugar free, sweetened with Splenda. Each slice is abundant with flavor and are also Fat Free, Cholesterol Free and Sodium Free. 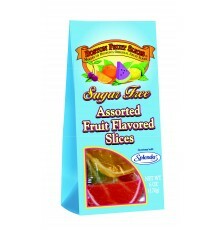 These sugar free fruit slices are also great for the diet conscious. Each bag contains orange, lemon, lime and cherry sugar free slices.